These improvements help you get the performance from Compute Engine that you need, in the configuration you want. 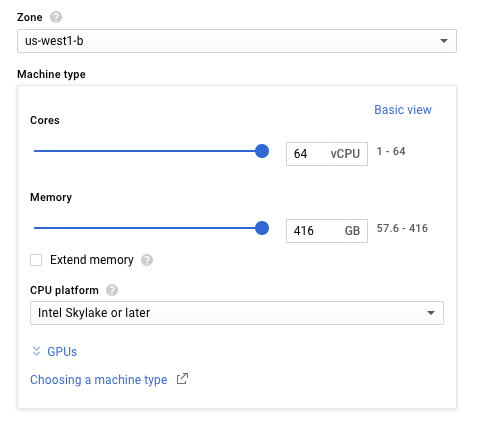 With this GA release, you can create new VMs with Skylake across Compute Engine’s complete family of VM instance types — standard, highmem, highcpu, Custom Machine Types, as well as Preemptible VMs. You can provision Skylake VMs using Cloud Console, the gcloud command line tool, or our APIs. Skylake is available in three GCP regions: Western US, Western Europe and Eastern Asia Pacific. Customer demand for Skylake has been very strong; we have more capacity arriving every day, and support for additional regions and zones coming in the near future. To help you experience Skylake, we’re offering Skylake VMs at no additional cost for a limited time. After a 60-day promotional period, Skylake VMs will be priced at a 6-10% premium depending on the specific machine configuration. Given the significant performance increase over previous generations of Intel processors, this continues our record of providing a leading price-performance cloud computing platform. Google Cloud Platform (GCP) regions and zones are equipped with a diverse set of Intel Xeon-based host machines, with CPUs including Sandy Bridge, Ivy Bridge, Haswell, Broadwell and now Skylake microarchitectures. In addition to fundamental systems features like clock speed and memory access time, these CPU platforms also support unique features like AVX-2 and AVX-512. Now, with our Minimum CPU Platform feature, you can select a specific CPU platform for VMs in that zone, and Compute Engine will always schedule your VM to that CPU family or above. 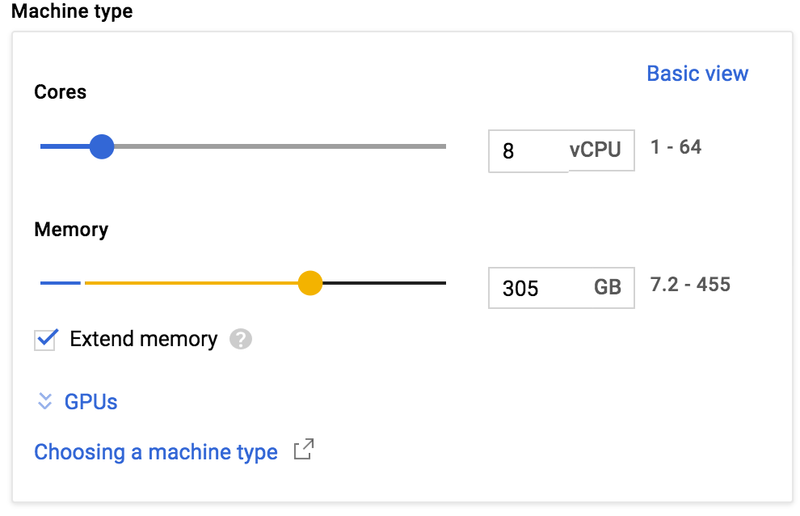 You can assign a minimum CPU platform to a VM from the Cloud Console, Google Cloud SDK, or API, with full flexibility to choose the CPU features that work best for your applications. Enabling this enhanced flexibility also allows us to now offer Broadwell CPU support in every region, as well as the ability to create VMs up to 64 vCPUs in size. In the gcloud command line tool, use the instances create subcommand, followed by the --min-cpu-platform flag to specify a minimum CPU platform. For example, the following command creates an n1-standard-1 instance with the Intel Broadwell (or later) CPU platform. To see which CPUs are available in different GCP zones, check our Available Regions and Zones page. For complete instructions for using –min-cpu-platform, please refer to our documentation. Compute Engine Custom Machine Types allow you to create virtual machines with the vCPU and memory ratios to fit your application needs. Now, with extended memory, we’ve removed memory ratio restrictions for a vCPU (previously set at 6.5GB), for a maximum of 455GB of memory per VM instance. This is great news for applications like in-memory databases (e.g. Memcached & Redis), high-performance relational databases (e.g. Microsoft SQL Server) and NoSQL databases (e.g. MongoDB) that benefit from flexible memory configurations to achieve optimum price-performance. To learn more about the pricing for extended memory please take a look at our pricing page. You can create a VM with extended memory using the Cloud Console, Cloud SDK or APIs. Complete instructions for using extended memory are available in our documentation. The minimum CPU platform selector, extended memory to 455GB, availability of 64-core machines, Broadwell processors in all regions and the GA of Skylake processors are now all available for you and your applications. If you’re new to GCP you can try all of this out when you sign up for $300 free trial. We’d love to hear about the amazing things you do with these Compute Engine enhancements in the comments below.